It is dawn near the mouth of the Pacora River (Panama) and the shorebirds are beginning to break from their night roost on an offshore bar. They move out over the water in dozens of flocks merging and splitting, folding and undulating, to make abstract sculptures between water and sky. The performance continues for more than an hour with flocks alternating between the stage and short respites along the shoreline. Part of a shorebird flock just offshore during the high-tide period near the Rio Pacora around dawn. 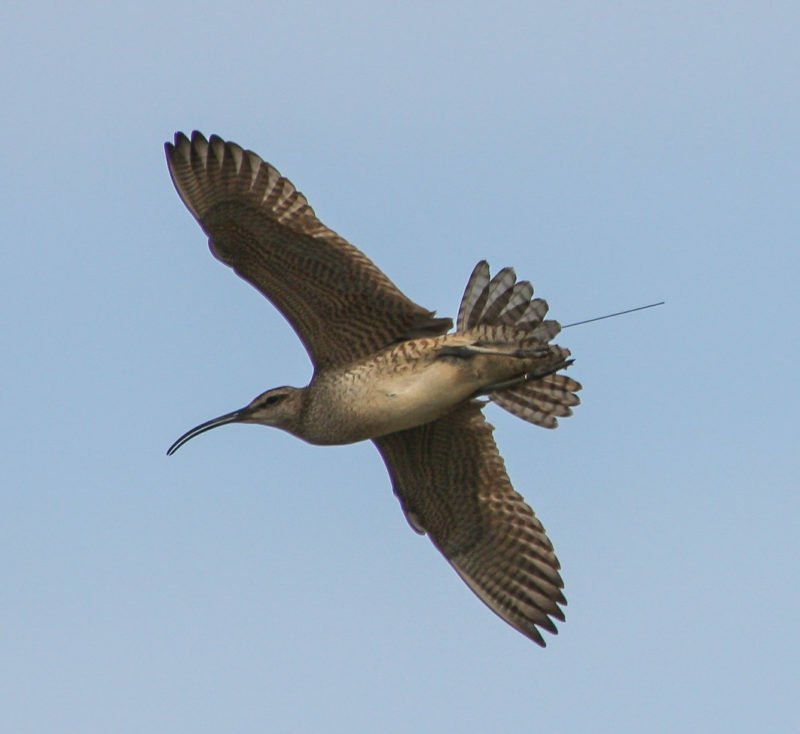 Many shorebird flocks of varying sizes were in flight simultaneously, merging and splitting constantly to form fluid shapes. Video footage by Bryan Watts. Pacora is shorebird central for 30 kilometers of coast where sand washed from the river has formed a wide delta that includes high, isolated sandbars. Once a month as the tide reaches above 17 feet, submerging all lower bars, the birds converge here where the high bars provide protection from predators and disturbance as they wait for the tide to retreat. On this day, the roost contains some 300,000 shorebirds of mostly western sandpiper (possibly approaching 10% of the global population of this species in a single roost), semipalmated sandpiper, and semipalmated plover. Pacora is a bone-jarring, hour-long journey from the nearest paved road. Biologists have been here all night listening to the cacophony of roosting birds just offshore and setting up nets to catch them with the changing tide. 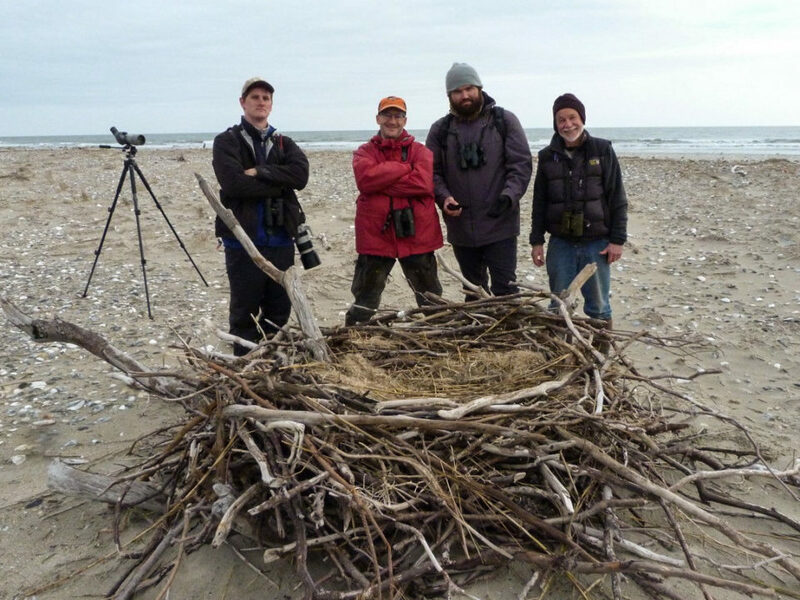 Bryan Watts, Bart Paxton and Fletcher Smith from The Center for Conservation Biology (CCB) at the College of William and Mary and Virginia Commonwealth University have joined with Rosabel Miró, Yenifer Diaz and Michelle Caballero from the Panama Audubon Society in an effort to study the birds. 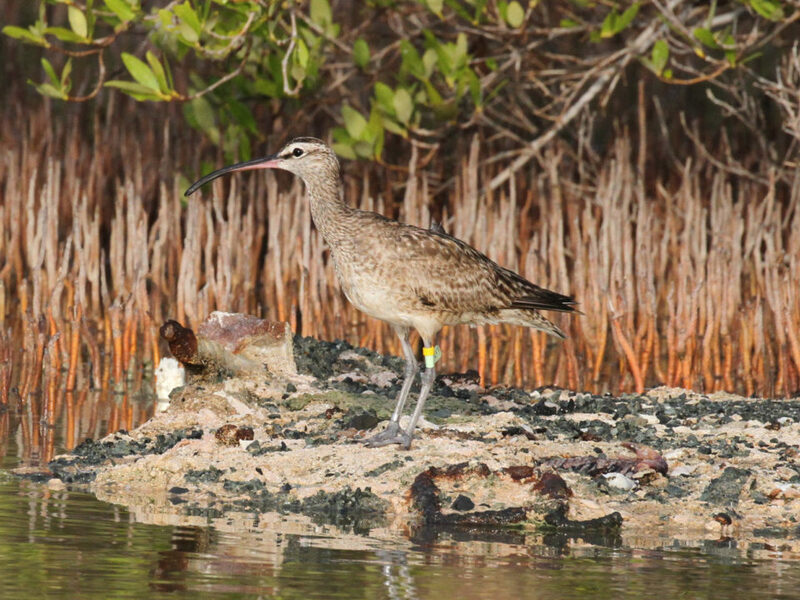 A collaboration between the National Audubon Society, Panama Audubon Society and CCB, the project’s focus is to establish a marking program in Central America for these birds and to train local biologists in banding techniques. The upper Bay of Panama appears to have been designed for shorebirds. Standing shoulder to shoulder with the Copper River Delta in Alaska, the Amazon Delta in Brazil, and the Bay of Fundy in Nova Scotia, the site is among the great shorebird conservation areas of the Western Hemisphere. 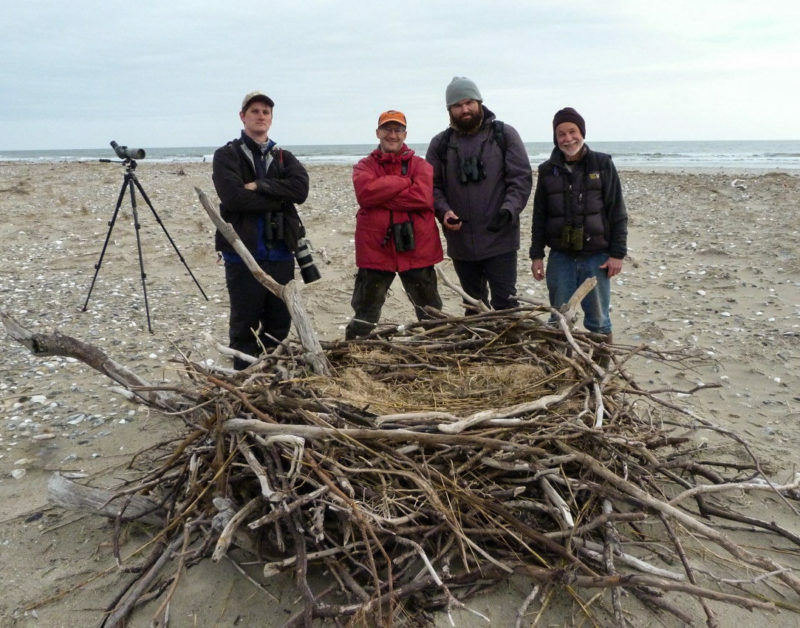 CCB has worked here off-and-on for more than 15 years to document the number of birds and to understand what role the location plays in their annual life cycle. The site is a critical staging area during migration and a fall molting ground. Most importantly, the upper Bay of Panama is their winter home. A flock of shorebirds land briefly along the shoreline during high tide. The birds remain in a tight group due to the presence of peregrine falcons along the tree line. Peregrines hunt for shorebirds along the shoreline using the beach and vegetation as concealment in low approaches. Video footage by Bryan Watts. Consistent with protocol over the previous several nights, biologists store captured birds in holding boxes and bring them to a central banding table for processing. Panama Audubon staff, local university students, local volunteers, and a biologist from Nicaragua take turns learning to identify, age, measure, weigh, and band the shorebirds. CCB biologists give instruction and demonstrations on banding techniques. For Panama to truly embrace its critical role in the living network of sites, we must have locally-based teams directly involved in research. Field techniques are foundational to the emerging research community throughout Central America. 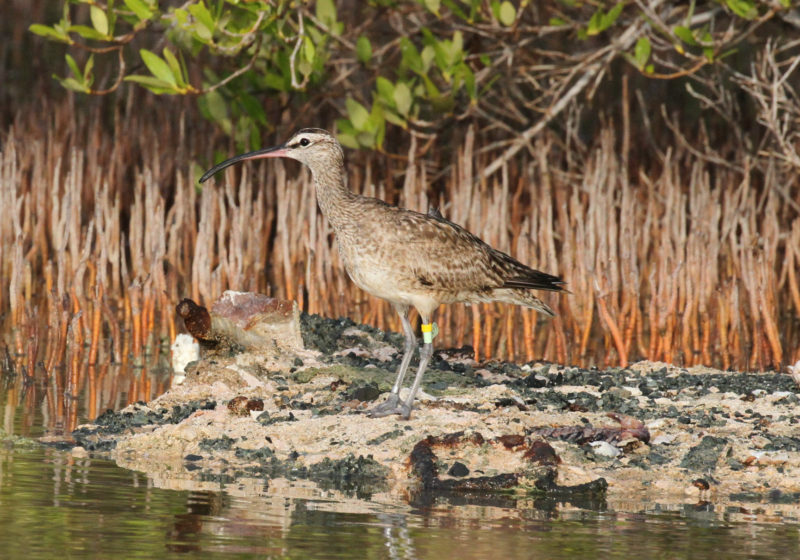 Before release, birds are fitted with coded leg flags that allow for the identification of each individual. Resighting of these flags throughout the Pacific Flyway will help us to better document migration pathways and contribute to our broader understanding of the demography that underlies population trends. During International Wetland Day, CCB biologists provided a workshop on resighting techniques to university students and the local birding community. Governed and coordinated by an international committee, flag colors have been assigned to regions and countries throughout the Western Hemisphere. Central America has been assigned a gray flag with black characters. The banding effort in Panama is the first to deploy such leg flags in Central America. 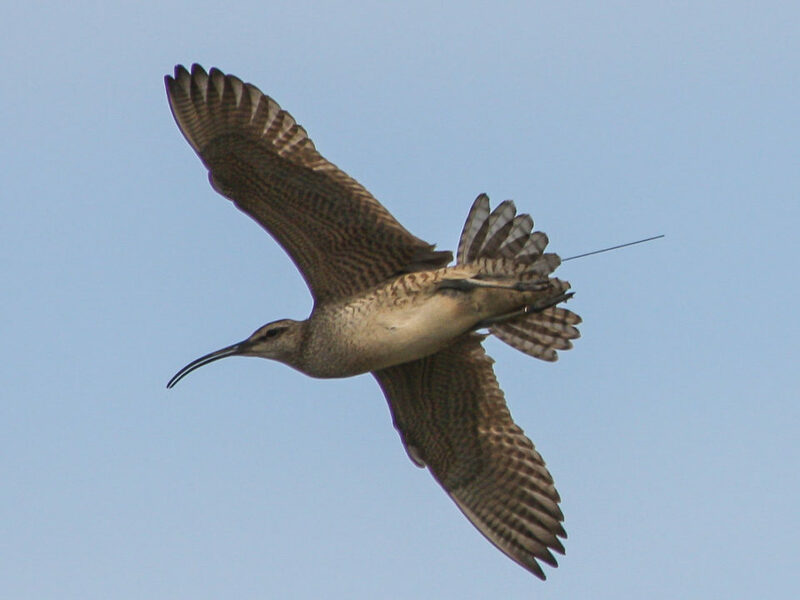 Winter represents the longest period during the annual cycle when these shorebirds remain in one place, and that place is here. As the morning wears on and the tide begins to recede, the shorebirds cover the mudflats and begin to feed. The rich marine resources within these flats are the reason that the birds are here. They are the unique contribution that Panama makes to these populations. These resources forever link this winter site in Panama to the breeding grounds in Alaska and migratory staging grounds in between. But it is the birds that are the common bond that links these places together and it is the birds that bring us all here to collaborate for their future. As the tide recedes, shorebirds rapidly spread across the mudflats to feed. These birds are feeding within a small bay along the shoreline. The upper Bay of Panama supports more than 100 square kilometers of this habitat. Video footage by Bryan Watts.